A year ago at this time I had the opportunity to be part of faculty for the launch of the Presidio Institute’s Cross-Sector Leadership Program in San Francisco. My role in representing IISC was to lead conversation around core concepts and frameworks related to the design and facilitation of complex multi-stakeholder change processes. On the last day of the launch I partnered with Jennifer Splansky Juster from the Collective Impact Forum to do a deeper dive around collaborative process design, with Jen offering more guidance around the specifics of taking a “collective impact” approach. During this session, I invited Fellows to step back and consider their cross-sector change work by reflecting on the framework above, the essence of which I have inherited from the thinking and work of Carol Sanford. Technology/Methodology – One observation from seeing many complex multi-stakeholder change initiatives is that they can get mired in “tactical sectarianism” – people otherwise aligned around the same big goal disagree about preferred change or problem-solving approaches/techniques. Some of this may be resolved by a deeper exploration of context (What is the core challenge/ opportunity? What is our desired future? What influencing factors must we consider?). It might also be resolved with an understanding that what is required is not an either/or but a both/and approach (inside-outside approach, reinforcing activities). It also may be helpful to look into some other underlying assumptions . . .
Ontology – The question at this level has to do with how people engaged in change/collective impact work think about human “being.” I was struck during a visit last year with the CSL Fellows to Google to hear the statement – “We believe that if we give people freedom, they will do amazing things.” This is a statement about human nature, or at least the nature of humans that Google hires. Change techniques can often be a reflection of what people believe about human nature. What do we believe about the starting point and potential of people implicated in our change work? Do we have different beliefs about different people? Why? How is this or isn’t it serving us/them? Cosmology – Underlying or associated with this view of human being is a worldview, a cosmology. It is significant, for example, whether one sees the world operating as a machine or as an evolving and dynamic system and how human beings fit into that view. Are people cogs or dynamic contributors? What do we believe about the world and the nature of change itself? How are our change methods an expression of this (or not)? Curious to hear reactions to this framework and questions and what they inspire as reflections on collective impact and social change work. Where you say “cosmology” don’t you really mean “phenomenology?” Both your definition of cosmology (which I have never heard before; cosmology is actually the study of the properties of the universe) and the place in your framework it occupies suggests to me that phenomenology is what you’re after. It is really important that ontology, epistemology and phenomenology are aligned. Thanks for your comment and question. I have not used the term phenomenology in this framework before. Phenomenology I understand as a kind of ontology, that is a way of understanding our perception of reality or being. 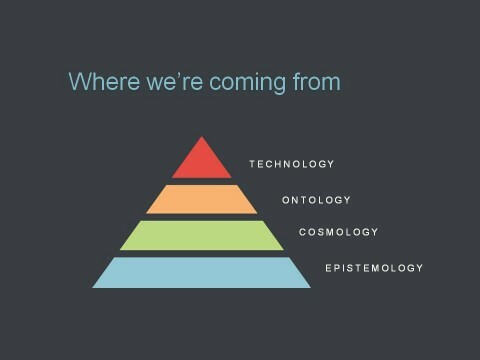 In that sense it almost seems like it overlaps ontology and epistemology. And I’m interested to explore this some more. I use cosmology here in more of an anthropological sense, that is understanding different “cultural” perceptions of the world beyond what is human nature. So perhaps “worldview” is a better term. And really the point is that alignment of these “-ologies” sets us up the possibility of greater impact of one’s chosen techniques (provided they align with reality, whatever that is:)).